Jin Wei and Tibet – a CCP rethink, or a pragmatist going out on a limb? In early June, Professor Jin Wei, an expert in religious and ethnic affairs at the Central Party School, gave an interview to the Hong Kong magazine Asia Weekly about Beijing’s Tibet policy. We are indebted to the International Campaign for Tibet for translating her interview in full . In what seems to be a central part of her argument, she discusses ways of working to “ensure that there is only a domestic [ie within Chinese borders] reincarnation of the Dalai Lama”. She recognizes the likelihood of there being “Twin Dalai Lamas”. “If the Dalai Lama impasse can be broken, we should fight to have the Dalai Lama reincarnation arise within the country”… in order to “avoid the embarrassment of the “Twin Panchen Lama event”. Controlling the reincarnation of the Dalai Lama she asserts, is vital to reduce international pressure for Tibet, calm “the anxiety and violent sentiments of Tibetan Groups on the mainland” and “disintegrat(ing) overseas Tibetan independence forces”. 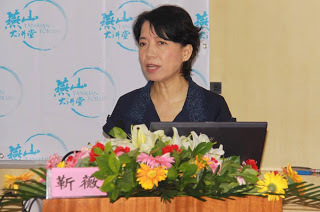 Jin Wei’s interview was fairly widely reported by international media, with some speculating that this could herald a policy transformation in Beijing, with others interpreting it as recognition that the Party would have to make certain concessions in order to retain control of Tibet.